ICanFixUpMyHome | A Wardrobe Bedroom Storage Solution | Increase your storage space and reduce clutter with this DIY project. © 2011 by Caroline Hansen all rights reserved; content may not be copied, rewritten, or republished without authors written permission. If space is of a premium in your house and you cant stand to look at mess or clutter then this DIY project has your name on it. Build a fitted wardrobe across the whole of one wall (or between insets) of your bedroom or spare room and hide all manner of household items behind it. The beauty of a self-built project like this is that you can customize the interior sections to meet your exact needs  and its pretty easy to do as well. A fitted wardrobe is based on a cube-like frame which is fixed directly to the bedroom walls, floor, and ceiling. There are no sides, back, top, or bottom to worry about  merely doors at the front and an interior structure of shelves and hanging space. 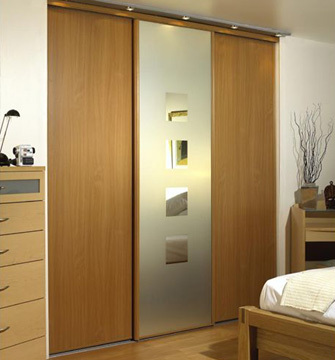 The doors can be purchased ready made and may be fixed on sliders or hinged. You may opt for a mirrored finish on some of the panels or simply go for all one material. Dont position the mirror to reflect your mattresses however as that is considered very bad feng shui! During construction, its important to make the interior as versatile as possible so you can easily change things up on the fly. Instead of permanently affixing the shelves, drill 1/4 holes on the interior vertical surfaces where the shelf ends will go. Every few inches from top to bottom is fine. Now its a simple matter of inserting shelf support pegs into the holes at appropriate heights (4 per shelf; 1 near each shelf corner). As for the shelves themselves, melamine-finished as well as wire shelves can be purchased at home improvement stores. The advantage of the melamine product is that it can be easily cut to size with a circular or table saw. If you go with wire, its best to check available lengths during the design phase. If your fitted cupboards are to be in the spare room then you might decide that as well as storage you want to conceal other things which will help the family get the most out of the room. A computer table is a popular choice, and many designs include a stool which can also be tucked away inside the wardrobe when not in use. If the drawers in your divan beds are already stuffed full of spare bedding, then how about incorporating some linen closet space by installing wide, deep shelves. I have even seen a fitted unit with a compartment to store the ironing board, iron and other housework essentials. You will no doubt be so pleased with the result and delighted with your handy-work that you will start assessing other rooms in the house for the potential for build-in units. As a DIY project this is second to none to give you confidence in your carpentry capabilities and make a real difference to your home. Website © 2011 Caroline Hansen all rights reserved; content may not be copied, rewritten, or republished without authors written permission.